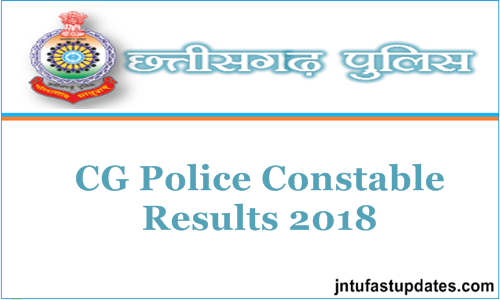 CG Police Constable Result 2018: Chhattisgarh Police Department has conducted the Police Constable written test on 25th March for all applicants. The CG Police Constable GD and Tradesman examination were held in many examination centers across the state. A huge number of aspirants dreaming to become police constable have clashed for this examination. The Chhattisgarh Police Department has released the CG Police Constable answer key after few days of the examination. Candidates competed for the test have checked with the answer keys and estimated the probable score. As per the latest updates from the Chhattisgarh Police department, the CG Police Constable results are expected to release shortly. Candidates can stay checking the official website, cgpolice.gov.in to download the results. Along with results, the CG Police Department will declare the cutoff marks and merit list of the CG Police Constable GD examination. Hopefuls can check more updates from the following article. Chhattisgarh Police Department has recently advertised 1786 police constable jobs and invited applications from the interested and eligible candidates. Nearly 1 lakh above aspirants have applied for the CG Police Constable posts during the application dates. The CG Police department is going to shortlist the candidates by organizing various tests such as written test, Physical eligibility test, Physical Measurements test, Medical examination, and document verification rounds. Candidates clearing all these rounds with a good score will finally get the opportunity to serve the CG police department. Board Name Chhattisgarh Police Department. Designation Police Constable (GD & Tradesman) Posts. Number of Vacancies 1786 Posts. CG Police Constable Written Test Date 25th March 2018. Job Type State Govt Job. Selection Process Physical Test & Written Exam. The Chhattisgarh Police Department is expected to announce the Constable results in the month of July (tentatively). Aspirants who had appeared for the examination have to stay patient until the organization announces the result date. Candidates can stay checking the Chhattisgarh police department official website, cgpolice.gov.in to check the latest updates. Candidates come across the examination can check the Chhattisgarh Police constable cutoff marks along with the results. The department will announce the cutoff marks/qualifying marks category-wise, subject-wise. Candidates can check whether they qualified the examination with required cutoff marks or not. If the hopefuls qualified the preliminary test, they will be allowed to appear for mains examination. On the homepage “Chhattisgarh Police Constable Result 2018” Link appears on the screen.